Imagine a private home sitting along the banks of a private trout stream and within a couple hundred feet of a cascading waterfall. 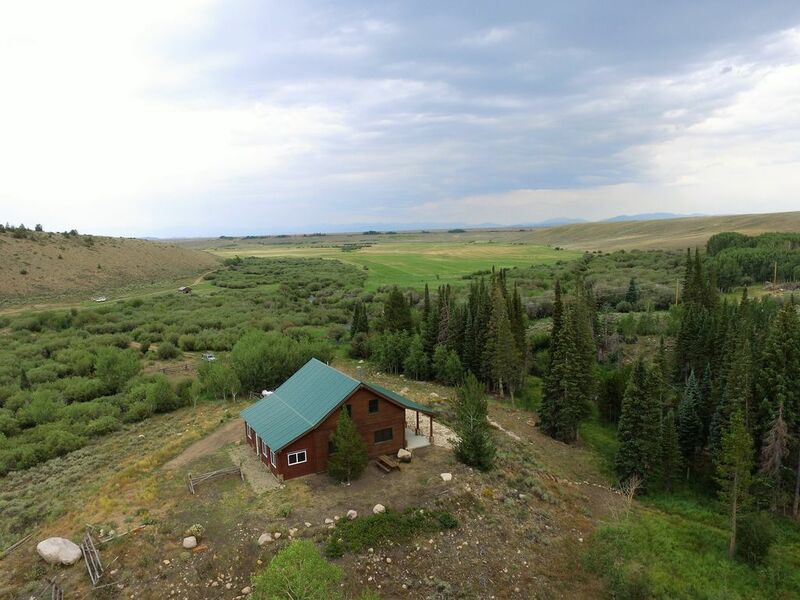 Now throw in breathtaking views of the Continental Divide, seclusion tucked in the back of a private ranch, luxurious appointments and all modern conveniences, yet is easily accessible by vehicle, and you’ve described the quintessential fly fishers retreat. Located 15 miles west of Walden on our private ranch, The Headwaters Cabin provides discerning fishermen luxurious appointments in a secluded setting free from the everyday distractions of cell service, internet, and television further assuring a visit where you “unplug” from the everyday stresses of life. The cabins interior is all blue-stained pine paneling and contains a living room with cathedral ceiling, comfortable leather furniture, and a wood burning stove. The full kitchen, complete with appliances, is well stocked with all the dishes, utensils, and pots and pans you will need. Dining seating is provided on the kitchen island as well as a bar height dining table or enjoy your meals on the covered porch providing views of the cascading stream. A full bath, complete with tub and shower, and a bedroom with a queen size log bed, round out the downstairs. An upstairs loft includes another sitting area, one queen bed, and two twin beds. The bathroom and all bedrooms are complete with linens, bedding, towels, soap, and shampoo. The last feature is the huge enclosed mudroom on the front of the building. It’s heated with a bar table, gun rack, fly rod rack, and wader and boot storage. It is a great place to keep all of your gear out of the elements. The cost for renting the cabin is $295/night for 1-2 people. Each additional person is $50/night with a maximum occupancy of 5 people. A minimum stay of 2 nights is required. Smoking and pets are strictly forbidden. We really enjoyed this place. It was very secluded (and a little hard to find). There was a small stream with small fish just 30 yards from the back door. We woke up to deer in the yard every day. Would definitely recommend this place if you want to have a break from the daily grind. Quiet secluded cabin by a mountain steam as advertised. Modern kitchen and well built cabin especially given the remote location. Scenery getting to the cabin will take your breath away.